3.4 提案編: 優先席案内 - dutcheez’s Fun with English! Priority seats are at the either end of each car. Please offer these seats to persons with disabilities, and/or those having any medical devices, the elderly, expectant mothers, and to passengers accompanying small children. Thank you for your generosity and cooperation. 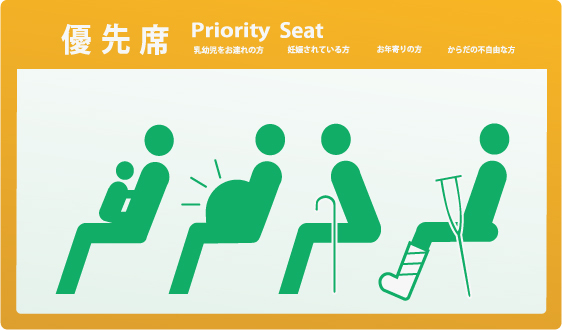 There are priority seats in most cars. Please offer your seat to those who may need it.